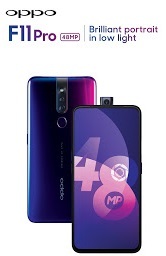 OPPO, a leading global smartphone brand, will kick-start its first sale of its newly launched OPPO F11 Pro smartphone from 15th March 2019. The device will be available on Flipkart, Amazon.in, Paytm, Snapdeal and across all OPPO stores. Priced at Rs. 24,990, the device will come in two unique color variants - Thunder black and Aurora Green. The smartphone features an ultra-high standard 48MP+5MP dual camera system for stunning low light photography and a design philosophy of minimalism with a rising front camera. OPPO F11 Pro comes with an exciting first sale offers that will make attractive proposition for consumers. Supported by OPPO's powerful camera technology, F11 Pro is equipped with ultra-high standard 48MP+5MP dual camera system, F1.79 aperture, ball-bearing closed-loop VCM, 6P lens, and 1/2.25-inch image sensors to bring more light. In bright light environments, the devices can directly output 48MP ultra FHD pictures. Additionally, in dark environments the F11 Pro's "Tetracell technology" analyses and combines the data acquired by four adjacent pixels to make it equivalent to a single pixel size of 1.6µm, doubling the size of the photosensitive pixel and shooting brighter and low-noise night portraits. OPPO F11 Pro has Ultra Night Mode and Dazzle Color Mode, which is, OPPO's system-level optimization solution specially designed for smartphone photography. This solution automatically recognizes the shooting scene and matches it with the targeted optimization solution. In Ultra Night Mode, it distinguishes between portraits and backgrounds, focuses on faces, and adjusts skin color in night portraits to enliven the overall effect. This also intelligently reduces the overall noise, suppressing highlights, improving the dynamic range, and increasing the brightness of dark areas to make night shots clean and clear. The F11 Pro is powered by a MediaTek Helio P70 and comes with a Panoramic Full Screen and 6GB RAM + 64GB ROM. It has VOOC flash charge 3.0 with 48MP+5MP dual rear camera and 16MP rising front camera. As for battery power, the smartphone is packed with a hefty 4,000 mAh battery rechargeable with OPPO's VOOC 3.0 charger and Color OS 6.0 that helps in providing special optimization for popular games. Compared with traditional mobile phones, its 6.5-inch screen and screen-to-body ratio of up to 90.9% delivers larger images and more visual space to live out eye-catching entertainment and gaming experiences. On the other hand, OPPO F11 which has gradient color design; comes with a waterdrop screen and 4GB RAM + 128GB ROM. It has VOOC flash charge 3.0 with 48MP+5MP dual rear camera and 16MP front camera. The smartphone packs a 4020mAh battery and Color OS 6.0 that runs smarter and more efficient. Keeping the after-sale service in focus, OPPO as a brand strongly believes in providing its users with the best service experience. It has one thousand and thirteen after-sale service centres across the globe that provides 1-hour repair service with standard service quality and OPPO care for all its products.